This villa is four floors of pure luxury, five bedrooms, six baths, pool, sundecks, and fireplaces. Located in 'Celebrity Row,' just a five-minute walk to the center of town (beaches, restaurants, markets, boutiques, discos). The villa is central to everything! This is one of the finest villas in the world, the rooms are filled with paintings, sculptures, and ancient Indian art. The villa's interior is decorated with lush tropical plants. Guest villa "LaCasita" sleeps 3 "CHARMING VILLA" totally independent of the main villa "Numero Uno"
A SENSATIONAL VIEW AND EXCEPTIONAL STAFF. 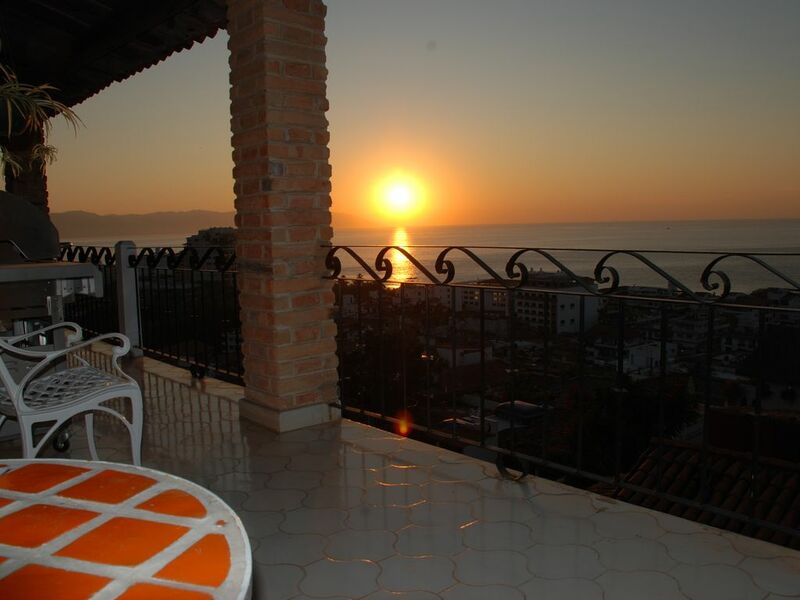 VIEWED BY MANY MAGAZINE AS ONE OF THE BEST STAFFED VILLAS IN PUERTO VALLARTA. WALKING DISTANCE TO THE BEACH, RESTAURANTS AND BOUTIQUES. in mind. Close to the Beach, Restaurants, Boutiques and directly above the famous 'Gudalupe Church'.